Armor actively reduces your security and compliance burden by providing the highest level of managed security for your customers’ data. Whether you host your data in our virtual private cloud or another cloud, our services enable you to more easily meet HIPAA, PCI and GDPR cloud compliance requirements. Armor actively defends sensitive ePHI, PII, credit card and transaction data. Outsource costs tied to staff, audit expertise and security via secure hosting solutions. Audit- and assessment-friendly, our services address key requirements of PCI and HIPAA compliance. Mapped roles and responsibilities for smooth PCI- and HIPAA- compliant hosting. The design strategy behind Armor’s secure cloud is based on the specific needs of PCI DSS-driven companies, particularly retail and financial payments organizations that must protect customers’ personal and financial data at all costs. At Armor, our solutions were designed with a security-first approach to result in compliance. Our security posture allows us to protect electronic medical records (EMR), electronic protected healthcare information (ePHI), and other sensitive data while streamlining the compliance audit process. With built-in security capabilities, Armor managed cloud security solutions address critical areas of GDPR cloud compliance for organizations with EU citizen PII workloads and applications. Armor partners with leaders in security compliance validation for PCI, HIPAA (HITRUST) and more. Gain insight into compliant hosting, gap analysis, remediation, audit, ongoing security and compliance monitoring, incident response and forensics. Through Armor’s partnerships with industry-leading compliance validation firms, it’s never been easier to achieve HIPAA, PCI and GDPR cloud compliance with Armor compliant hosting solutions. 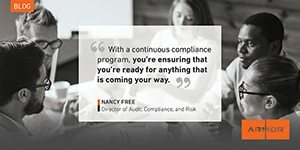 Use this six-step framework to better understand how to approach HIPAA, PCI and GDPR cloud compliance and your recurring audits. You can’t enable proper cyber security or comply with regulations if you don’t know what data you store, transmit or access. Map and classify your data, determine which are in the scope of various cloud compliance requirements (e.g., HIPAA, PCI, GDPR, etc.) and record where they're located. Cloud compliance is a foundation to security, but it’s just a baseline and can't be the sole objective for a security program. The smart approach is to build a sound security strategy and environment that will go above and beyond basic compliance requirements. The investment in a compliant hosting solution will better protect data, customers and your business in the long run. Much of the legwork outlined in steps 3-6 is minimized if you partner with a proven security expert to protect your data in a compliant hosting environment. This compliant partner can provide the necessary paperwork for your audit. The right vendor will also offer consultation through other aspects of the audit, if necessary. Each regulation is different — and some are more prescriptive than others (e.g., PCI). Start your journey by first familiarizing yourself with any regulations that affect your data. Enlist the help of cloud compliance experts or certified auditors to gain a deeper understanding of the process. It’s time. At this stage, you’ll begin aligning your environment and data with the secure cloud controls of specific requirements. As mentioned, some regulations are more prescriptive than others, so there may a handful of judgment calls. A qualified security vendor will share this burden with you and minimize some of the work — particularly if they're already securing your data in a HIPAA-, PCI- or GDPR-compliant cloud environment. Document everything about your security compliance — environment, data, workloads, internal tests, policies, technology, controls, third-party access, etc. — for your auditor. Not only will this make their job easier, but it will prove that you’re organized, proactive and detailed-oriented. It’s also advisable to collect two or three examples of clear and comprehensive evidence that shows you’ve met each control.